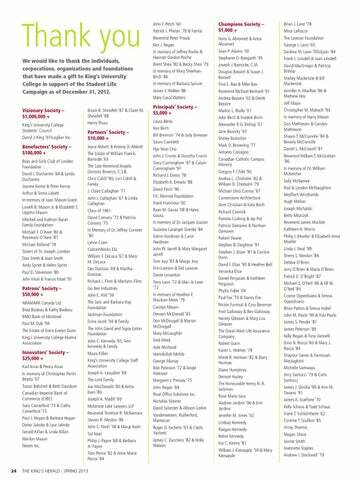 Thank you We would like to thank the individuals, corporations, organizations and foundations that have made a gift to King’s University College in support of the Student Life Campaign as of December 31, 2012. Visionary Society – $1,000,000 + King’s University College Students’ Council Darryl J. 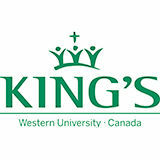 King ‘97/Logikor Inc.
Innovators’ Society – $25,000 + Karl Arvai & Penny Arvai In memory of Christopher Perrin Beatty ‘07 Tozun Bahcheli & Beth Davidson Canadian Imperial Bank of Commerce (CIBC) Gary Comerford ‘73 & Cathy Comerford ‘73 Paul J. Hogan & Barbara Hogan Dieter Jahnke & Lyse Jahnke Gerald Killan & Linda Killan Marilyn Mason Nexen Inc.